The following companies have sponsored the ITC. ITC sponsors the Totally TaeKwonDo Magazine which is a downloadable PDF magazine for TaeKwonDo enthusiasts across the globe. The magazine dedicated to all aspects of the martial art of Tae Kwon Do, arguably the world's most popular martial art and Olympic sport. The magazine caters for all styles of the art, so whether you're Ch'ang Hon/ITF, KKW/WTF or any other style of Tae Kwon Do, then the magazine will be of interest to you. 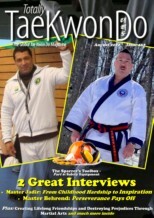 So if you do Taekwon-Do, Taekwondo or Tae Kwon Do, then this magazines for you. In an industry synonymous with loyalty VERVE is a brand built on a family focus of good quality, affordability and exceptional service, from this - our mission statement and slogan was born! BDS provides a professional installation, repair and maintenance service for industrial and pedestrian doors, shutters and barriers. With a combined experience of over 50 years in the repair and service Industry, BDS is confident that requirements will not only be met, but will be exceeded. Established for over 30 years and are happy to offer our signwriting and graphic design services for just about anything. From a single vehicle to fleet deals, we have it all covered. We are able to design, supply and fit anywhere in the U.K.
We can tackle roofs, bonnets, boats and even helicopters!